There's been no shortage of Harrison Ford interviews of late covering everything from Han Solo's relationship status to his injury on the set. The latest comes from People Magazine who releasing a special Star Wars: The Force Awakens collectors edition this month. 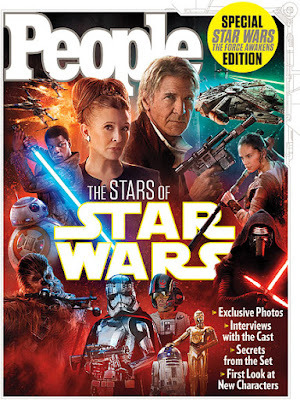 The issue includes an interview with Harrison Ford about returning to the role that made him famous, Han Solo. Like Han Solo, Harrison Ford himself has finally awakened to the force of Star Wars. He's come a long way from wanting to kill off the popular character while making the original movie trilogy to now playing a crucial role in Star Wars: The Force Awakens. "It might have felt silly, but it didn't," Ford, 73, says in PEOPLE's Star Wars special issue of reprising his role as Han Solo. "It was fun to work with [director] J.J. Abrams, who brought great energy, passion and clear focus to the whole event. So I had a good time." While Han Solo was the breakout performance that launched Ford to Hollywood stardom and iconic roles including Indiana Jones and Jack Ryan, the actor has never been a Star Wars fanboy. As Ford told PEOPLE after the 1977 premiere of the first movie, Star Wars was "a silly movie but wonderfully made." See exclusive photos, get a first look at new characters and learn more secrets from the cast and crew of Star Wars: The Force Awakens in PEOPLE's Star Wars collector's edition, on newsstands Dec. 9. Yet Ford seemed to understand the character of Solo better than anyone. He earned the role over established stars like Al Pacino and Kurt Russell because he was so convincing as the Han Solo stand-in during early auditions. And Ford helped shape Solo's look: "The first [costume] iteration had a large blue Peter Pan collar attached to the shirt, which I resisted," he says. Ford even ad-libbed the now-famous "I know" response to Princess Leia's declaration of love in 1980's The Empire Strikes Back, and he pushed George Lucas to kill Solo in 1983's Return of the Jedi to show the stakes of galactic war. Lucas kept him alive. Since that movie, though, Ford hasn't been spending his time obsessing over the questions that fans have been asking: Did Princess Leia and Han Solo go on to get married? Did they have kids who embraced the Force, unlike their father before them? Answers won't be revealed until the movie's global premiere on Dec. 18. Until then, "I don't worry about saying anything," Ford says. "I'm very comfortable with just keeping my mouth shut." The Star Wars: The Force Awakens People Magazine issue hits newsstands on December 9th.